Book club questions for discussion of Through Eyes Like Mine. Multicultural identity is at the core of Nori's experience. How does the first chapter "Name" hint at these tensions. In what other sections does the narrator struggle with her developing identity? Nori recalls many firsts: memories, injuries, Christmases, days of school. What did these childhood moments trigger in your memory? The family's decision to adopt internationally brings up complicated feelings for the narrator. How does Mitch's arrival shift family dynamics? How does Greg Bob's death influence Nori's understanding of life and death? Catholicism and the St. Francis parish are a strong presence in many of Nori's early memories. How do her attitudes toward the church appear to shift throughout the book? How do Nori's relationships with Chet, Laura and Mitch inform her world? How does Nori's understanding of adult problems such as death, illness, and divorce evolve throughout the book? Visits with extended families, both the Nakada's on her dad's side, and the Barry's on her mom's side, expand Nori's world. How does spending time with both families create insider/outsider experiences for the narrator and her family? How does the town of Bend shape Nori's childhood? How would a different setting have changed her perspective? How does Nori's exposure to pop culture (TV shows, movies, toys) capture a childhood of the 80s? Discuss the author's use of vignettes. How does this form help/hinder the story? Nori spends much of her childhood wishing for snow. Discuss snow as a symbol in this memoir. 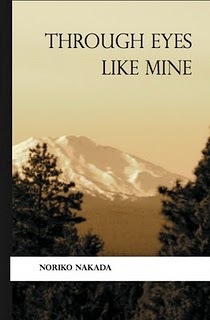 Through Eyes Like Mine has been criticized for being too quiet or a book where not much happens compared to many popular memoirs with more drama and trauma. How does this memoir compare to others you've read? Write about the history of your name and your family's names. Write about your first memory, encounter with pain, or death. Write about your first memory of your parents, siblings or childhood friends. Write your version of a significant family event. Write about your childhood fears and hopes. Think of a natural element like snow and write about it as a symbol for events in your life.